Check out his interview to learn more about some of the numerous ways one can get involved in Debian, managing its infrastructure… and without having to be a packager. Jörg: My name is Jörg Jaspert and I’m 35 years old working for a small company doing system administration and consulting work for our customers. I’m married for a little while now and sometime soon a little Ganneff will be crawling out of my wife. (Whoever didn’t think of the movie “Alien” now is just boring). Raphael: How did you start contributing to Debian? Jörg: I started using Debian somewhere around 2000, 2001. Before that I had the misfortune to try SuSE and RedHat, both with a user experience that let me fully understand why people think Linux is unusable. (Due to my work I’m in the unfortunate situation to have to use RedHat on two machines. Funny how they are still utter crap and worse than bad toys). And all of this “lets get a Linux running here” came up because I was trying to find a replacement for my beloved OS/2 installation, which I had for some years. So after I got Debian installed, good old Potato, I got myself active on our mailing lists, starting with the German user one. an impression that this can be fun, if there are just some visitors for an event. So I tried again and did help as staff on a LinuxTag booth a while later. The software I packaged, found me a sponsor and voila, maintainer I was. Some more packages got added and at some point my sponsor turned out to be my advocate. The NM process run around 2 months, and mid April 2002 I got THE MAIL. 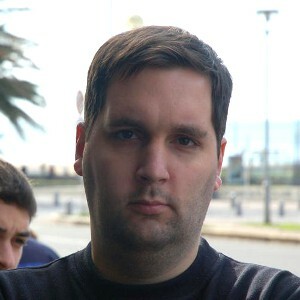 Raphael: Some Debian developers believe that you have too many responsibilities within Debian (DAM, FTPMaster, Debconf, Partners, Planet Debian, Mirrors, …). Do you agree that it can be problematic, and if yes, are you trying to scale down? And yes, I do have some extra groups and roles. And you even only list some, leaving out all I do outside Debian. But simply counting number of roles is a plain stupid way to go. Way more interesting is how much work is behind a role and how many other people are involved. DAM: Here I did start out assisting James to get the huge backload down which had accumulated over time. Nowadays I am merely the one with the longest term as DAM. Christoph Berg joined in April 2008 and Enrico Zini followed during October 2010, both very active. Especially Enrico, lately with the redesign of the NM webpages. FTPMaster: The basic outline of the FTPMaster history is similar to the DAM one. I joined as an assistant, after the oh-so-famous Vancouver meeting in 2004. Together with Jeroen, we both then got the backload down which had accumulated there. He did most of the removals while I had a fun time cleaning up NEW. And we both prepared patches for the codebase. And in 2007, as the last action as DPL, Sam made me FTPMaster. Since then I haven’t been alone either. In fact we have much more rotation in the team than ever before, which is a good thing. Today we are 3 FTPMasters, 4 FTP Assistants and 1 Trainee. Though we always like new blood and would welcome more volunteers. DebConf: I am very far outside the central DebConf team. I am not even a delegate here. Currently I am merely an admin, though there are 4 others with the same rights on the DebConf machines. I’ve not taken any extra jobs this year, nor will I. Probably for next year again, but not 2012. Planet: I am one of three again, but then Planet is mostly running itself. Debian developers can just edit the config, cron is doing the work, not much needed here. Occasional cleanups, every now and then a mail to answer, done. In short: No real workload attached. Mirrors: My main part here is the ftpsync scriptset. Which is a small part of the actual work. The majority of it, like checking mirrors, getting them to fix errors, etc. is done by Simon Paillard (and since some time, Raphael Geissert is active there too, you might have heard about his http.debian.net). Having said that, there is stuff I could have handled better or probably faster. There always is. Right now I have 2 outstanding things I want to do a (last) cleanup on and then give away. Raphael: You got married last year. I know by experience that entertaining a relationship and/or a family takes time. How do you manage to combine this with your Debian involvement? Raphael: Thanks to the continuous work of many new volunteers, the NEW queue is no longer a bottleneck. What are the next challenges for the FTPmaster team? Also, “no longer” sounds like its recent. It’s not, it’s just that people usually recognize the negative only and not the positive parts. Well, there are a few challenges actually. The first one, even if it sounds simple, is an ongoing one: We need Debian Developers willing to do the work that is hidden behind those simple graphs. Yes, we are currently having a great FTP Team doing a splendid work in keeping that queue reasonably small — this is a/THE sisyphean task per excellence. There will always be something waiting for NEW, even if you just cleaned the queue, you turn around and there is something else back in already. Spreading this workload to more people helps not burning one out. So if one or more of the readers is interested, we always like new volunteers. You simply need to be an uploading DD and have a bit of free time. For the rest we do have training procedures in place. Another one is getting the “multi-archive” stuff done. The goal is to end up with ONE host for all our archives. One dak installation. But separate overrides, trees, mirrors, policies and people (think RMs, backports team, security team). While this is halfway easy to think of in terms of “merging backports into main” it gets an interesting side note when you think of “merging security into main”. The security archive does have information that is limited to few people before public release of a security announce, and so we must make sure our database isn’t leaking information. Or our filesystem layer handling. Or logs. Etc. Especially as the database is synced in (near) realtime to a DD accessible machine. And the filesystem data too, just a little less often. There is also a discussion about a good way to setup a “PPA for Debian” service. We do have a very far developed proposal here how it should work, and I really should do the finishing touches and get it to the public. Might even get a GSoC project on it. So far for some short to middle term goals. If you want to go really long term, I do think that we should get to the point where we get rid of the classical view of a source package being one (or more) tarballs plus the Debian changes. Where a new version requires the full upload of one or more of those parts of the source package. I don’t know exactly where it should end up. Sure, stuff like “one central DVCS, maintainers push there, the archive generates the source tarballs and prepares the mirrors” do sound good for a quick glance. But there are lots of trouble and pitfalls and probably some dragons hidden here. Raphael: The Debian repositories are managed by DAK (Debian Archive Kit) which is not packaged. Thus Debian users pick tools like reprepro to manage their package repositories. Is that how things should be? Jörg: Oh, Mark Hymers wants to do a package again. More power to him if he does, though yes, DAK is not exactly a quick-and-easy thing to install. But nowadays it is a trillion times easier than the past — thanks to Mark’s work people can now follow the instructions, scripts and whatever they find inside the setup directory. Still, it really depends on the archive size you are managing. A complex tool like dak does not make sense for someone who wants to publish one or a dozen of his own packages somewhere. Thats just like doing a finger amputation with a chainsaw — it certainly works and is fun for the one with the chainsaw — but you probably end up a little overdoing it. I myself am using dpkg-scan[packages|sources] from a shell script but also mini-dinstall in places (never got friend with reprepro when I looked at it). Works, and for the few dozen packages those places manage it is more than enough. Also, using dak forces you into some ways of behaviour that are just what Debian wants — but might not be what a user wants. Like inability to overwrite an existing file. One of the reasons why mentors.debian.net won’t work with dak. Or the use of a postgres database. Or that of gpg. Sure, if you end up having more than just a dozen packages, if you have many suites and also movement between them, then dak is sure a thing to look at. Raphael: What is the role of Debian Account Managers (DAM)? Do you believe that DAMs have a responsibility to “shape” Debian by defining limits in terms of who can join and what can be done within Debian? The Debian Account Managers (DAM) are responsible for maintaining the list of members of the Debian Project, also known as Debian Developers. DAMs are authoritative in deciding who is a member of the Debian Project and can take subsequent actions such as approving and expelling Project members. Now, aside from this quote, my OWN PERSONAL OPINION, without wearing anything even vaguely resembling a DAM hat: DAM is the one post that is entitled to decide who is a member or not. Usually that is in the way of joining (or not), which is simple enough. But every now and then this also means acting on a request to do something about whatever behaviour of a Debian Project member. I hate that (and i think one can easily replace I with WE there). But it’s our job. We usually aren’t quick about it. And we don’t act on our own initiative when we do, we always have (numerous) other DDs complain/appeal/talk/whatever to us first. The “expulsion procedure”, luckily not invoked that often, does guarantee a slow process and lots of input from others. Are we the best for it? Probably not, we are just some people out of a thousand who happen to have a very similar hobby — Debian. We aren’t trained in dealing with the situations that can come up. But we are THE role inside Debian that is empowered to make such decisions, so naturally it ends up with us. Raphael: You did a lot of things for Debian over the years. What did bring you the most joy? Are there things that you’re still bitter about? Jörg: The most joy? Hrm, without being involved in Debian and SPI I would never have met my wife. Or a GR against me. Not many running around with that badge, though I’m still missing my own personal “Serious problems with Mr. Jaspert” thread. Bad you all. Or visited so many places. Think of all the DebConfs, QA meetings, BSPs and whatever events. Or met so many people. Or learned so many things I would never even have come near without being DD. Raphael: Is there someone in Debian that you admire for their contributions? Thank you to Jörg for the time spent answering my questions. I hope you enjoyed reading his answers as I did. Note that older interviews are indexed on wiki.debian.org/PeopleBehindDebian.